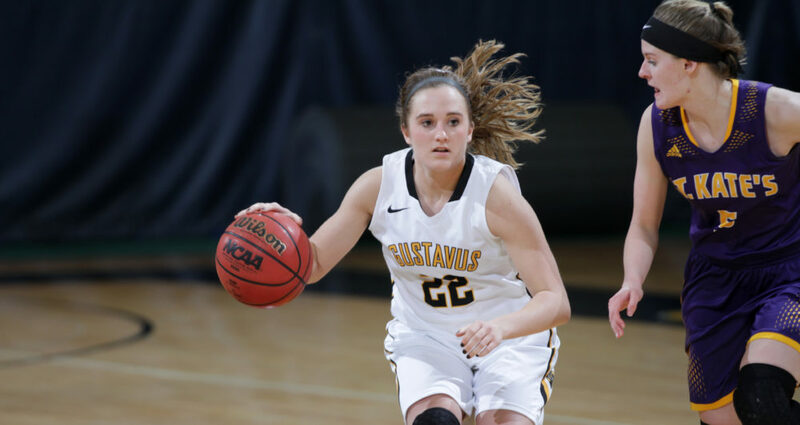 SAINT PAUL, Minn. – The Gustavus women’s basketball team Saturday suffered a 64-58 loss at St. Catherine, dropping to 7-8 overall and 4-4 in the MIAC. The Gusties led by as much as 10 in the fourth quarter, but the Wildcats finished the game on a 14-1 run in the final 3:41 to complete the improbable comeback. After trading the lead three times in the first quarter, the Gusties took a 13-10 advantage into the second quarter. Gustavus started the second frame on an 11-3 run before the Wildcats responded with a 12-3 run of their own to claim a 25-24 lead with 3:42 left in the half. The Gusties were able to regain the advantage and took a 31-29 lead into halftime. The Black and Gold outscored the home team 18-10 in the third quarter and carried a 49-39 lead into the fourth quarter, but that’s when the tides turned in favor of the Wildcats as they went on a 25-9 run over the final 10 minutes to secure their first victory over Gustavus since 2008, snapping a 21-game losing streak. The Gusties shot 38.5 percent from the floor, including a 7-for-21 mark from three-point range, but were just 11-for-22 from the free throw line. Justine Lee (Sr., Dawson, Minn.) led the Gustie offense with 22 points, along with five steals. Kendall Thompson (Sr., Eden Prairie, Minn.) contributed 11 points and a team-best seven rebounds. Gustavus next travels to Macalester 7 p.m. Wednesday.